Rutsch is always "scribbling and scrabbling." He is an artist of the purest breed—an artist who has no choice but to paint. He is a chosen traveler of the depths of existence; a man who follows a longing to explore his inner self and relate his findings with the energy and identity of the universe. The celebrated Austrian artist approaches painting and sculpture as he lives life—with the eyes of a child and the hand of a poet. Constantly in the quest for rhythms of form and vibrations of color, he catches those "sparks in the shadow" and evidences their fullest reality and beauty in his creations. Each of his paintings is a careful construction as it is a spontaneous act of love. While he might attribute certain artistic expressions to "coincidence," his inspiration comes from such diverse sources as: memories, dreams, sounds, numbers, telephone poles and drift wood. Rutsch has an affinity to vibrant colors, strong contours and rich brush strokes which are apparent in his oils, mixed media works and ink drawings. He has a sensitivity to the unusual, the discarded and a fondness for the ugly as well as the chaotic. These, he often transforms into poignant welded steel abstractions. Rutsch has an aversion to politics, citing dates and expounding upon honors achieved. There is no talk about 'profound symbolism' in his work and as Carlo McCormick writes in the introduction to Rutsch's monograph, "Meaning is not a seed that Rutsch plants, nurtures and then harvests. It is what grows wild in a volcanic swamp of fossilized, decaying and new-born fancies—as an afterthought and aftershock." Alexander Rutsch is not concerned with interpretations; he is, however, passionate about the process of making art and surrenders his entire being as an instrument to the act of creation. The geometry of his imagination overflows with figures, profiles and penetrating strong eyes—windows to a deeper place. Their vitality and sensuality pulsate through the "dreamscapes" of Rutsch's created worlds. At times romantic, yet always wild with energy, human forms and experiences are essential to the artist's vocabulary. The son of opera singers and a singer himself, Rutsch speaks of "the art of painting as the art of silence" and the job of the painter "to dedicate himself to the silence." He adds though, "that this silence is the greatest existing sound in the universe." One wonders why then, if painting is "the art of silence," that Rutsch's paintings scream with sound. Sometimes melancholy, sometimes sensual, sometimes dissonant and sometimes whispering, the rhythms are always rich in the celebration of life and our shared humanity. Painter, sculptor and poet, Rutsch's oeuvre over the past four decades is tremendous. Celebrated and collected especially in Vienna, Paris, Brussels and New York, he studied with renowned teachers like Boeckl and Dorowsky and collaborated with such geniuses as Salvador Dali. Having left Vienna in the fifties, Rutsch moved to Paris and took the city's art scene by storm. There, Picasso was so enthralled with a portrait Rutsch has done of him that, in a state of great excitement, he countersigned it. Alexander Rutsch was born in Russia in 1916 but raised in Belgrade, Yugoslavia. After studying voice in Austria he became an opera singer like his parents, but after WWII, Rutsch's love for visual expression propelled him to change careers. He was a painter, sculptor, philosopher, musician, singer and poet. His life as a romantic is reflected in his work, as he sought to perfect his soul and humanity, "I paint my dreams," said Rutsch. "My dreams are color and life. They soar in my head like millions of symphonies. I can never stop building dreams." In 1952, after studying under Josef Dobrowsky, Josef Hoffmann and Herbert Boeckl at the Vienna Academy of Fine Arts, Alexander Rutsch received a scholarship to study in France. There he made contacts and began collaborations with his contemporaries, Picasso and Dali. Rutsch said of his experiences with Picasso, "Picasso played a short but important moment in my life in Paris that affected my entire artistic future. I learned from him that it is not important if art is not aesthetically finished. It can be raw, uncooked, rough. If an artist feels he has said it—it is not important to polish or finish it. Because of Picasso, I learned that if I don't feel the need to finish—I don't have to." In 1954 he exhibited his work at the Salon Artistique International de Saceux and won first prize for abstract painting, the first of may awards received during his prolific career. During the 13 years he lived in Paris, Rutsch exhibited in many prominent galleries there and throughout Europe. In 1958, The City of Paris awarded him the prestigious Arts, Science and Letters Silver Medal. In 1966, Jean Desvilles presented his prize winning film "Le Monde de Rutsch" at the Cannes Film Festival and the Venice Biennial. 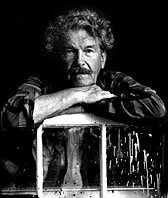 In 1968 Rutsch moved to Pelham, New York where he continued to work in his studio and exhibit in galleries and museums worldwide. Rutsch's work, as seen through his mastery of many art forms—sculpture, painting, print-making, and drawing, and a wide variety of other media has been described as "vibrating showers of lines, bold geometries, wounded anatomically rambling scrap-wood skeletons, enigmatic totem figures, and congregations of fetishized, domesticated, and recycled rubbish heaps that conspire to a fantasy of Expressionism, Cubism, Dada, Fauvism, Cobra, and Primitivism." His pieces, as described by Emily Genauer, import silence and the monumentality of primitive statuary. His sculptures are stylized to abstract construction made of "found" objects welded and reshaped into bronze figures and animals of uncommon wit, airy, with grace and individuality. His portraits are crisp, intense, spare linear characterizations. Rutsch's creations suggest empathy. Alexander Rutsch passed away in 1997. His friends, supporters and family established the bi-annual Alexander Rutsch Award and Exhibition competition for visual artists.